Short-tailed groom suit made from a grey mohair wool blend fabric with redingote-style seams. 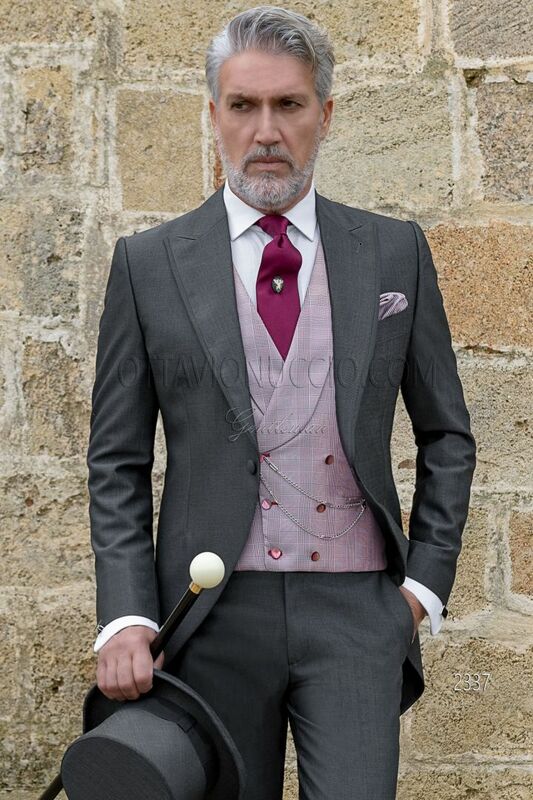 Peak lapel with trims in c... Short-tailed groom suit made from a grey mohair wool blend fabric with redingote-style seams. Peak lapel with trims in contrast black satin fabric and single button closure. 3 buttons with straight buttonholes for each sleeve and single vent at back The jacket in the standard size 50 measures 90 cm from neck to hem. 8.5 cm tie in wool acetate, satin effect in solid color. Handmade. Silk Prince of wales Handkerchief. Handmade. Black cane made from wood with ivory-tone knob. Nickel-tone detail at the lower end. This classic design has been styled... Black cane made from wood with ivory-tone knob. Nickel-tone detail at the lower end. This classic design has been styled with a morning dress. Tie pin with black cameo. Protective cap.